Nå tilgjengelig på stedet bilutleie, Vi har en Mitsubishi Pajaro Seter 7 til leie. Denne tomannsbolig ligger kun 30 meter fra Friendship Beach i Rawai. Det tilbyr luksuriøse og moderne innkvartering i vakre omgivelser. Omgitt av tropiske palmer, utvikling tar hedersplassen i et rolig område av hovedveien til Rawai. Fullt møblert og utstyrt, det er to soverom og to bad i øverste etasje og stue og privat basseng i første etasje. Flatskjerm-TV og DVD-spiller er i alle rom, 42 "på soverom og 55" i stua. I tillegg til standard kjøkkenutstyr er det også en oppvaskmaskin, kaffemaskin, vaskemaskin og tørketrommel. Vær oppmerksom på at stranden er ikke bra for svømming som vannet er svært grunt. Bassengområdet er tilgjengelig via stuen og gir en ekstra stue med en dobbel solseng og bord for to. I tillegg til 20 kv. M. privat basseng, er det brusende vann vegg-funksjonen, forbedret med fargerik belysning. Travertin stepping steiner føre til en uteplass som inkluderer en BBQ skape en intim og allsidig uterom. Høye murer og en avtagende skape en helt privat plass, perfekt for avslapning. Hele eiendommen er ferdig i dempede, nøytrale toner med odd pop av farge i kunstverket, noe som gir en komfortabel, men likevel elegant preg. Blandingen av materialer som brukes, fra chunky tremøbler til de bleke kjøkkenskap og sort granitt, skifer grå baderomsfliser og tre soverom etasjer, fullføre luksuriøse, høy kvalitet eiendom. Godset har 24 timers sikkerhet og et felles 20m svømmebasseng og sala. Bare en kort spasertur unna ligger Friendship Beach, et rolig område med sand på Chalong Bay. Området er fullt av en rekke restauranter, butikker og aktiviteter. Chalong Pier, Rawai Beach og Nai Harn Beach er sikker på å gi noe spesielt for alle, fra dykking og båtturer til soling og fersk sjømat til golf eller bare slappe av på stranden nyter solskinn og varmt vær. Kroppsvask og såpe inkludert det er også en hårføner. Honda klikk motorsykkel til leie 200bhat per dag Flyplasstransport tilgjengelig. 1-3 personer 1200 Baht 4-6 personer 1400 Baht ..... 24 timer i døgnet Trådløs e-Skriver i villa for de som trenger å kombinere arbeid med glede. Også fungerer med Ipads trenger bare å installere HP ePrint App. Kodi TV sammen med Live TV fra USA Canada og Storbritannia, inkludert alle de store sportskanaler, NFL, NBA, NHL, savner ikke noe kamp mens du er borte. We had a very nice time. The place was perfect; great pool and good location also very roomy. All in all, thanks for having us.!! Upon arrival at the airport, we were picked up by a driver arranged by the host that took us straight to the Villa. Once inside, the villa, we were greeted by Joe, the manager. He was very friendly and informative and showed us everything we needed to know about the villa. We exchanged contact information and he even dropped us off to a local restaurant and grocery store. He even arranged for a taxi to return us to the Villa. The Villa was exactly as described in the pictures. Very nice and updated appliances and decor. The pool was GREAT. Overall the villa was very clean and comfortable with plenty of space. The TV worked and the air conditioners kept us very cool. Be sure you turn off the AC when you leave as there is a max per day electric usage. The host arranged for us to use his motorbike and we used it the first day, but we ended up renting a car for the remaining days that we were in Phuket. Although we didn't have to talk to the owner of the unit, his manager was VERY helpful and we contacted him whenever we needed something. Overall we had a great time in Phuket, thanks to the accommodations we were in. Ian's property was well described and we enjoyed a total of 10 days there. It's a rather quiet corner of Phuket that lies in proximity to some of the most beautiful beaches. Just be aware that you need a motorbike or regular Taxi transfers to get there - we took advantage of Ian's additional motorbike offer. The beach that is close to the property is nice for relaxing and kite surfing but not suitable for swimming as low tide is really really low. Villa da mille e una notte !!!!! Siamo stati in questa magnifica villa per 3 settimane e tutto era magnifico . La villa possiede ogni tipo di confort , l'arredamento e stupendo e c'è tutto quello di cui si a bisogno . Joe il manager è pronto per ogni tua richiesta . Ian è un propietario molto attento e rispondeva sempre subito a ogni mia domanda prima della partenza . é stata un vacanza da sogno in una villa da favola . andate e non esitate . "We have been in this magnificent villa for 3 weeks and everything was great. The villa has any kind of comfort, the decor is beautiful and there is everything you need to. Joe the manager is ready for all your requests. Ian is an owner very attentive and always answered my every question immediately before departure. has been a dream vacation in a fabulous villa. go and do not hesitate." My wife and I just turned 60, for a special vacation we started in Chaing Mia, and worked our way south. Hua Hin, Koh Samui and Krabi. We where very fortunate to land in Phuket and stay at Ian's villa. Because of the volume of fringes (foreigners) who enjoy Thailand each year, it is easy to end up in a miniature hotel room, and stuffed onto overcrowded beaches like sardines in a can. THIS IS WHERE IAN'S VILLA EXCELS!!! Quite beach less than 100 yards from the property. No it is not the white sand beaches, with crystal clear water found on the Islands surrounding Phuket, But it is a great spot to start a days adventure or finish off the night, listening to the waves lapping up onto the sandy beach. The Villa is complete in every detail down to small flashlights by bed stands and, the huge BBQ, with a Local market (2 X a week) within walking distance, offering fresh fruit, vegetables, and seafood so you can cook your own dinners. A short walk on the beach brings you to a great restaurant where food is complemented by the friendly staff, and seating thirty feet from the ocean. You need transportation to get around, whether exploring the Big Buddha site, going to different beaches, day trips to the Islands (A Must Do) or discovering a Thai BBQ restaurant, a Taxi cab, or scooter---for the adventurous is a must. Our drive from the airport to Villa (45 minutes)got us in touch with Viratt, a great taxi driver, and tour guide. Dropping by with fresh pineapples, bananas, mangos or just checking up on us we felt privileged to have a driver at our beck and call. (Or Thai Taxi Stand minutes from Villa.) CAUTION: before you jump on a tour boat and head for Phi Phi islands, or other destinations, research your choices. "Offspray Liesure" a great tour boat service that will not overpack their boats to make an extra buck, at your expense. Service 1st class. If the boat can hold 24 people they take 15-17. 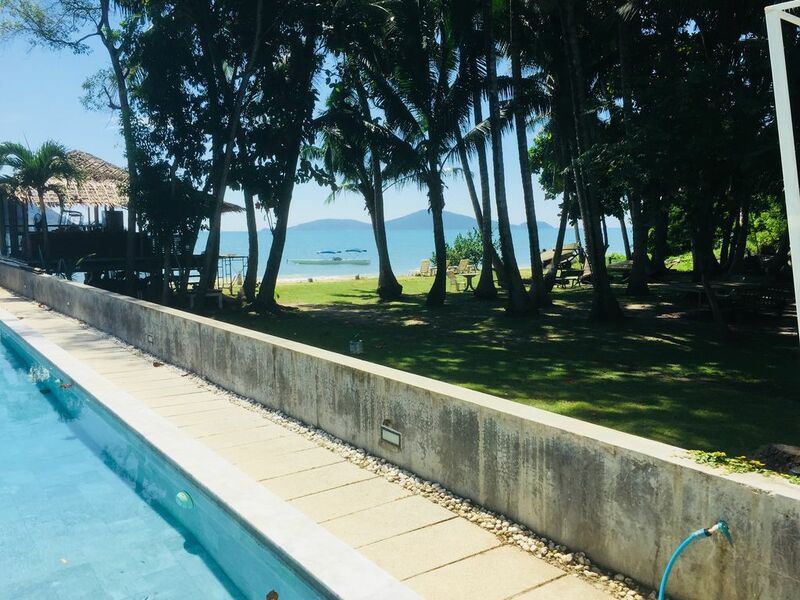 What Ian writes about the Villa is exactly what you get, great value for your money, clean comfortable with everything you need for R & R. Huge bedrooms, great private pool, and Pascal steered us to great spots to see and feel Thailand. Beachfront villa? I say condo w/beach access. We felt this property was misrepresented. It is not beachfront as there are 5 units, a pool and deck between it and the beach. Also I pulled it up using the house filter and the owner uses the term "house" in description. Not so, see pictures. Also, the Seatours tour company recommended seemed to be a scam. I say this because: 1)they accept only cash; 2)they have no office by that name in Phuket and insist payment be made by appointment at the condo and 3)the seem to have no connection to the company found when you go to the website. I believe they simply take your cash, skim off the top and stick you with whichever operator they can. You can book direct with many companies using credit card, giving you the protection you need in case of fraud. We lost two of four days messing around with this company. The beach is ok, not good for swimming especially since several affluent lines dump nearby (see photos). Given the difficulty of getting around Phuket you might think twice before staying in the area if you want to hang out on a nicer beach. It took us 1.5 hours to get to the airport. The unit itself is quite nice and accurately described. Pascal was very friendly and responded quickly to minor issues. In my listing i fully describe and show many photos,that are a very accurate and show exactly what you will be staying in. In no way do i miss represent the property. The company that this client refers to ( seatours ) was not recommended by myself. When potential clients inquire about my villa i send them an information sheet explaining about all distances to shopping,restaurants,grocery stores and boat tours.I do not suggest who to use it is up to each client.I leave many pamphlets in the villa for clients to choose the best company for them. The area where my villa is located is one of the best on the island....many beautiful beaches all within a very short drive .....again i do mention this in the information sheet i send to all clients before reserving. Now in Phuket it is high season....it takes a bit longer to get around...you must plan ahead. 50 units of electric included per day on daily and weekly rates. Extra electric units invoiced at check out at 12 Bhat per unit Electric and water not included in monthly rate. Electric 12 bhat per unit and water 18bhat per unit for monthly rates and over on daily and weekly rates. Airport transfer available 1-3 people 1200 Bhat or 4+ people 1400 Bhat. Payable directly to the driver. Motor bike available 200 Bhat per day Payments 25% down payment upon reservation balance 30 days before arrival. Payments thru home away Scooter available 200 per day.